The Special Operations Division provides specialized support to the Patrol Divisions and Precincts, the Investigations Division and the Corrections Bureau. Members of the Special Operations Division are ready to respond with specialized skills, training and equipment to assist with public gatherings, special events, emergencies, crime scenes and natural disasters anywhere in Salt Lake County. The units that make up the Special Operations Division include: the K-9 Unit, SWAT Team, Canyon Patrol, Motorcycle Squad, Search and Rescue, Mounted Posse, and School Crossing Guards. The K-9 Unit consists of a sergeant and six, full-time officer-handlers that provide canine support to Patrol, Investigations, and Corrections. In addition, the unit has four other officer-handlers that have canine partners assigned to them in a secondary capacity. The unit is often called upon to assist Federal, State, and other local law enforcement agencies. The officers and their canine partners work the evening and graveyard shifts in patrol, but are subject to call-out at any time the resource is needed. They search for and apprehend high-risk criminals who have fled from law enforcement and/or concealed themselves to avoid capture. Additionally, the unit can provide dogs for evidence searches and narcotics detection. The unit also provides canine demonstrations throughout the year for school programs, scout groups, community activities, and special interest groups. These demonstrations provide an excellent opportunity to promote a greater understanding of how and why canines benefit law enforcement and citizens in their efforts to keep our communities safe. The UPD's K-9 Unit consists of 11 professional K9 handlers that provide canine support to Patrol, Investigations, and Corrections. The unit is often called upon to assist Federal, State, and other local law enforcement agencies. The officers and their canine partners typically work the evening and graveyard shifts in patrol, but are subject to call-out any time the resource is needed. They search for and apprehend high-risk criminals who have fled from law enforcement and/or concealed themselves to avoid capture. Additionally, the unit can provide dogs for explosive detection, narcotics detection and forensic/cadaver detection. Police Service Dogs have amazing olfactory capabilities. Without their keen sense of smell, these dogs would be of little use for law enforcement. Most people have seen a demonstration at one time or another showing how the patrol dogs chase down suspects. This, however, is a very small portion of what they do. They are a search and location tool, first and foremost. Unfortunately, suspects being searched for are often uncooperative, violent law breakers and their immediate apprehension is necessary. To that end, patrol dogs are trained to defend themselves, their handlers and apprehend fleeing criminals. The police dog of today is like its human counterpart, professional and highly trained. All of UPD's dogs are kenneled at the handler's home. Handlers literally spend more time with their K-9 partners than members of their own family. 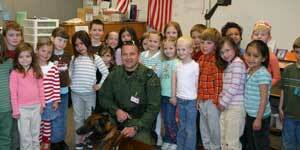 Nearly all of UPD's K-9 handlers have children. These dogs blend in well in the family environment. This interaction is a big reason why we have such "social" animals. They understand the difference between work and off time and behave accordingly. Many people refer to police dogs as "mean." Mean dogs have no place in today's Police Service Dog programs. The unit conducts canine demonstrations for school programs, scout groups, community activities, and special interest groups. These demonstrations provide an excellent opportunity to promote a greater understanding of how and why canines benefit law enforcement in their efforts to keep our communities safe. The Office SWAT Team is highly trained in specialized tactical operations and is deployed in high-risk situations in order to minimize the risk of injury or death to officers and the public. The primary mission of the SWAT Team is to save lives. The unit is comprised of a Lieutenant Commander, two Sergeants, and 40 Operators. The SWAT Team membership consists of officers and paramedics from the Unified Police Department, Taylorsville Police, and the Unified Fire Authority. Team members are certified in diverse specialties including firearms instruction, explosive breaching, chemical munitions, less lethal force, emergency tactical medicine, and marksmen. The SWAT Team had its busiest year ever in 2007 conducting or participating in a team record 55 operations including numerous search warrants and callouts. The team also assisted in one urban search and rescue operation. The team logged over 15,000 hours in training and operations. The team received training in various specialized disciplines throughout the year including hostage rescue techniques, vehicle assaults, warrant service techniques, static and dynamic building clearing, explosive breaching, scouting and intelligence gathering, downed-officer rescues and barricaded suspect scenarios. 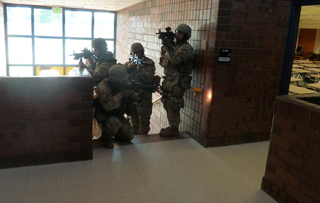 The SWAT Team also assisted in training other office members in various tactical techniques. 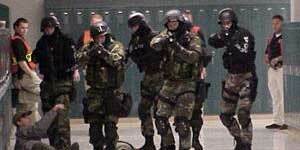 In 2007, in cooperation with the Unified Fire Authority, the SWAT Team began a tactical paramedic program to further enhance the life-saving capabilities of the Team. The UPD SWAT Team is highly trained in specialized tactical operations and is deployed in high-risk situations in order to minimize the risk of injury or death to officers and the public. The primary mission of the SWAT Team is to save lives. The unit is comprised of a Lieutenant Commander, four Sergeants, 27 Operators and nine Tactical Paramedics from the Unified Fire Authority. Team members are certified in diverse specialties including firearms instruction, explosive breaching, chemical munitions, less lethal force, emergency tactical medicine, and marksmen. The SWAT Team had its busiest year ever in 2012 conducting or participating in a team record 56 operations including numerous search warrants and callouts. The team also assisted in one urban search and rescue operation. The team logged over 17,600 hours in training and operations. Currently, the Canyon Patrol Unit consists of 2 Sergeants and 17 Officers. The officers in this unit provide all aspects of law enforcement services within the canyon areas of Salt Lake County, including Big and Little Cottonwood Canyons, Emigration Canyon, East Canyon, Lambs Canyon, Millcreek Canyon, Butterfield Canyon, and many other mountainous areas. They conduct follow-up investigations for property crimes that occur within these canyons. Even though the canyons are not densely populated, their popularity as a destination for tourists and other visitors makes them a very busy area. The Cottonwood Canyons alone receive an estimated 8 million visitors every year (by contrast, Yellowstone National Park receives an estimated 3 million visitors per year). The unique canyon environment presents a need for a variety of specialized skills above and beyond what is expected of the average patrol officer. These Canyon officers receive training in the use of snowmobiles, all terrain vehicles, avalanche transceivers, and helicopter operations to name a few. The officers are equipped to handle a wide variety of emergency and rescue calls. 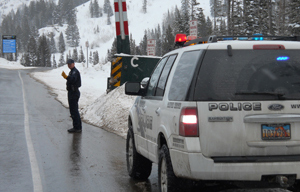 The unit also works collaboratively with the U.S. Forest Service, Unified Fire Authority, the town of Alta, Salt Lake City Division of Water Quality, Utah Department of Transportation Avalanche Forecasters, UDOT road crews, air medical helicopters, Wasatch Powderbird Guides, Wasatch Back-Country Rescue, and the ski patrols of each of the resorts in the area. The Canyon Patrol’s operations are supplemented by the Salt Lake County Sheriff's Office Search and Rescue team. Canyon Patrol officers are also tasked with providing community-oriented policing duties as a part of their assignment. Officers are the liaisons with ski resorts and all community councils. The Unified Police Department Office Motor Squad has a proud tradition of service dating back to 1932. The Motor Squad consists of 18 Officers and 1 Sergeant. The UPD Office Motor Squad rides Harley-Davidson motorcycles and serves the public in a wide variety of assignments. Members of the Motor Squad complete an intensive two-week course to become certified as a Motor Officer. Following the initial course, officers continue to train throughout their tenure with the squad. The squad enforces speed and traffic laws throughout the county. They also assist the patrol divisions, support Canyon Patrol, participate in parades, regulate traffic-controlled community and charity events, enforce DUI and seat belt laws, participate in funeral escorts, provide dignitary motorcade escorts and assist in a wide variety of community events. 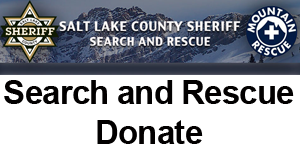 The Salt Lake County Sheriff’s Office Search and Rescue Team is comprised of approximately 30 mountain rescue volunteers. Search & Rescue, in conjunction with the UPD Canyon Patrol Unit, is trained and equipped to respond to any type of backcountry emergency - day or night, 365 days a year. The team celebrated its 50th year of operation in 2007. On average, the team contributes 5,000 to 7,000 hours of their own time annually responding to callouts, training for emergencies and conducting public awareness presentations. Search & Rescue members are expected to be proficient in technical rock and ice climbing, high angle snow mountaineering, emergency medicine, avalanche recovery, swift water rescue and open water rescue and recovery. 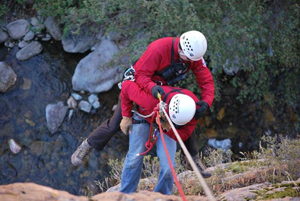 Common rescue operations in Salt Lake County including lost or injured hikers, fallen or stranded climbers, injured skiers, avalanche victim recovery or water searches, rescues and recoveries. The Salt Lake County Search & Rescue Team depends on the services of volunteers to operate. Any interested individual capable of donating 200 to 300 hours annually and skilled in technical rock, snow and/or ice climbing, mountaineering, swift water rescue, emergency medicine, and/or backcountry skiing are encouraged to complete and submit the online application available on this website or you can email melsmith@updsl.org with questions. As a 501.c3 organization, the team relies on charitable donations to supplement the county and state funding needed to support day-to-day operational, training, and equipment expenses. 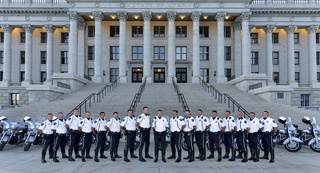 In existence for more than 47 years, the Unified Police Department's Mounted Posse is currently a 16-member riding club who belong to the Utah State Western Riding Club Association (USWRCA). Members compete in individual and team events as well as in numerous parade and drill competitions. All members represent the UPD in many volunteer services. Last year members donated over 2,000 hours in service to Salt Lake County. During the spring, they hold an open horse show for the youth and help with Wheeler Farm Family Fun Day. In December, they visit an elderly care center, taking Santa Claus along, and bring a small gift for each of the residents. 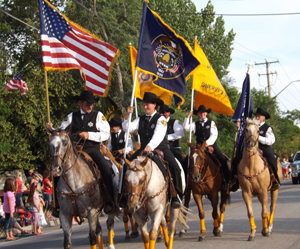 The Posse Members volunteer their time, horses, and services for the opportunity to represent the UPD. 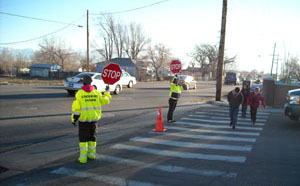 The Unified Police Department Special Operations Division is staffed with 260 regular and substitute crossing guards for 69 area schools in Canyons, Jordan, and Granite School Districts. These schools are located within the unincorporated / township areas of Salt Lake County, as well as in Herriman City, Holladay City, Midvale City, Riverton City, and Taylorsville City through a contract agreement with the UPD. These dedicated men and women brave the various extreme weather conditions to ensure the safety of the children as they cross hazardous roadways going to and from school. The Unified Police Department appreciates these hard-working crossing guards, and we are committed to keeping our children safe. Want to Become a Crossing Guard? The UPD is now hiring crossing guards. For more information, visit our employment page.